Since the day of the Xbox 360 release, storage space for the device has been overpriced beyond belief. OEM 250GB HDD models still cost $110 USD! A 250GB hard drive should not destroy my wallet, Microsoft. Storage space, especially on HDDs, is cheap. You can buy a removable 2TB external for only $100 USD, so it's a little beyond my comprehension to see how they calculate their MSRP to yield such a large profit. On the other hand, Xbox 360 had very impressive hardware specs back in the day, equipped with a triple core CPU, which was unheard of at that time. The only thing that makes a 360 HDD unique from others is a special secure file system and sector, so we can essentially hack other hard drives to do the same thing. In this Null Byte, let's go over how we can hack a cheap alternative hard drive to work with our Xbox 360s. I do not know if the latest Xbox dashboard can do silent scans for this and ban you accordingly. The latest update was very sneaky, so be safe. Purchase and use any one of the following drives to hack for use with your Xbox. This is what allows your Xbox 360 drive to use the space on the disk. Only the following sizes are allowed, even if your disk is larger. Download the one that you need. Right-click and unzip it to your desktop. HDDHackr is our tool of choice. Make sure it is downloaded and waiting on your desktop. First, we need to make sure our device is formatted properly to be booted from when we toss the tool on there. Right click the USB drive and click format. Make a DOS boot disc and select quick format. Grab the Windows Bootable USB Drive Creator tool. Unzip files via right-click > extract. Select quick-format and Create bootable DOS drive. Browse and choose the USB Drive Boot Files\MS-DOS folder as the location. Now we need to drag the files to the bootable drive that we will use to hack our HDD. Extract the drive sector data and the HDDHackr tool that you have on your desktop into the root of the bootable device that we made. Make sure your .BIN file is named HDDSS.BIN. Connect the hard drive that you are hacking in place of your main computer hard drive. If you don't know how to do it, check out this tutorial from LifeHacker. Keep your hacked USB connected. Text in bold indicates a DOS prompt command that you need to type. Boot your computer and strike F12 (normally) to get into your boot menu. Enter the number corresponding to your drive letter. It is the SATA drive with WD somewhere in its name. You will get a message saying, "The information in file HDDSS.BIN does NOT match the drive's firmware info. Do you want to flash the Xbox 360 compatible firmware?" Hit Y. Your drive is now hacked! To install it, simply remove the screws and case from your old HDD and swap it out for the new one. Have fun with your less-than-half-price HDD. I actually asked xbox support if 3rd party drives were aloud. Clearly you dont understand the ToS or hardware. How would M$ be able to tell if it was a third-party hdd or a home hacked one. The 120GB Driver Sector Data was linked to 320GB. Good catch. The link has been updated to the correct 120GB version. Everything in the tutorial worked like a charm. However, there is a step missing (it could be my computer that caused it). In step 3, after I selected usb, I was given a c:\ prompt but nothing else. The letter represented the usb stick with the appropriate files on it. So I typed in hddhackr.exe (I think that was the name) and hit enter. Then I was able to continue on as the tutorial stated. You may want to check into this. At any rate, I was able to get 228gb more hdd space than the 4gb I had. Hi Rob, Could you help me out with this? 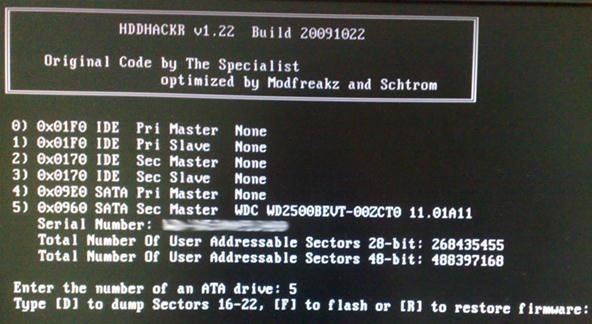 So I'm trying to hack my Xbox 360 3GB with this HDD - WD3200AAKS, 320 GB, 7200rpm, SATA. I'm not sure if this is gonna work, because this type of HDD is not on the list. However, it's a Western Digital as the other ones, so I wanna give it a try. I need your help, I'm new at this. Not even sure if I will be able to connect it to Xbox through Sata. So what happens if you connect a drive without doing this first? It won't crash at all. The os is installed on the system memory. It will however try Nd force you to install an update to your Gb onboard memory. Man when I tried to boot into the usb drive Windows Millennium Emergency boot shows up, (I did the second way to create the bootable usb drive) how can I solve this? I did something wrong? I can however run hddhackr in DOS but no ATA drives are recognised ?? ?